is it just me, or has this been the LONGEST week ever? i don’t know what it is about coming back to work after a vacation (apparently, even 2 days out of the city sours me on it), but on tuesday, i already wanted it to be friday. and now that it’s thursday, well, let’s just say i realllly want it to be friday. thankfully, my new job offers summer fridays, otherwise known as the world’s greatest summer invention. i’m pretty summer fridays are unique to new yorkers, offering a chance for the rich folk to get a head start on the trek out to their hamptons home each weekend. i don’t have a hamptons home and likely never will, but you can bet i still love getting out at 1pm every friday. though actually, i’ve had so much work to do that i’ve been leaving closer to 4pm. but STILL, there is a difference between leaving at 4 and leaving at 7 or 8, and that difference smells like sunshine and feels like heaven. since this week has been a rather stressful one, i’ve been doing a whole lot of imaginary online shopping (and i may or may not have actually ordered that bobbi brown beach body oil, because, well, sometimes a girl needs body oil). you might notice i switched up the font a bit for this week’s shopping list. how do we like the script? it’s kind of pretty, right? feels a bit more summery, i think. i’ve got a biiig crush on these smokin’ hot kate spade studs – how cute are they?! – and also on these ear cuffs from baublebar. 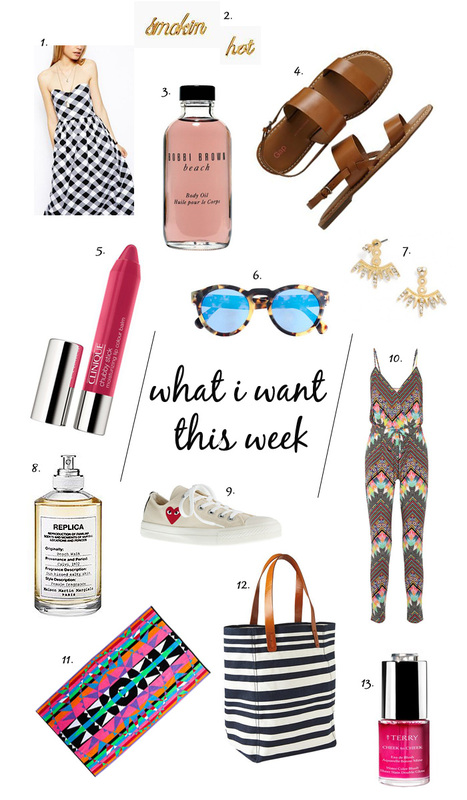 and let’s talk about that mara hoffman jumpsuit, which is only as good as the somewhat-matching mara hoffman beach towel (from madewell, oddly). mara always does the coolest prints, and these two pieces are no exception. happy shopping, folks! ps: just 2 days ’til it’s officially summer.